When I was young, Barbecues, weren't just a means of charring sausages, they were an event. Enough food and drink to feed a family at least four times the size of ours would be prepared, the fire would be lit early, to allow sufficient time for the cooking plate to be evenly heated, and we'd all be dressed in our going out clothes before marching into the back yard to eat. We'd even take paper serviettes as they were known before they were called napkins. My father and I would also have to don silly outfits, chefs caps and aprons with slogans like "What's Cooking?" on them to ensure that we didn't get any grease on our going out clothes. I'm not sure what my parents were thinking to subject me to the dual embarrassment of watching my father dressed like that, while being similarly attired, but it did have something of a lasting impact on my sartorial habits. The reason that my siblings, being just enough years younger than I to have avoided the need to don funny hats while eating outdoors, have apparently made their way through life with substantially fewer emotional scars than I, can probably be deduced from this one photograph alone, but as if to rub salt into my already gaping wounds, there are plenty more where that came from! 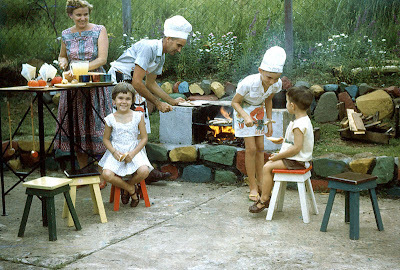 The whole barbecue thing gathered quite some momentum in the early sixties, at a time when the greater Brisbane area was undergoing what today would be called infrastructure works, but in those days was simply described as "being sewered". Houses were being connected to a trunk sewerage at a great rate of knots and the old "outhouses" were being replaced often with purpose built lean-to's accessible from within the house envelope, with a special indoor WC compartment. We moved into a house at exactly the time that the barbecue movement reached something of a crescendo and to add to the excitement, "the sewer" was going in as well. It wasn't going to be good enough to have a simple hot plate and some painted rocks in this house apparently, so my father took advantage of the mess being made by the installation of the sewerage pipes and levelled the new barbecue area. He spent more than a few weekends building a monster construction out of concrete blocks with some screen "breeze" blocks in the end and it's own flue in the centre. Together my parents made a canvas cover to fit the rotary clothes line, so we could even barbecue when it was raining. No stone was left unturned in the quest for the ultimate backyard experience. My grandfather didn't understand any of this modern stuff, which he thought was surely turning life as he knew it on its head. "In my time", he said "we used to 'do our business' in the backyard, and cook in the house." I'll bet he didn't get dressed in his going out clothes for his trips to his backyard. That is one simply amazing photo ... looks like something out of a 1950s women's magazine. BBQs though rare in our household were reserved for a picnic in the bush, never a backyard affair. I think I missed something.